Wash the zucchini, cut into thin slices, cut it lengthwise, season with salt and cook on both sides on a very hot griddle. Cut the smoked cheese so as to obtain 12 sticks. Toast the pine nuts in a nonstick skillet, being careful not to burn. In a bowl put the extra virgin olive oil with the chopped herbs, salt and beat with a fork, resulting in an emulsion aromatic. 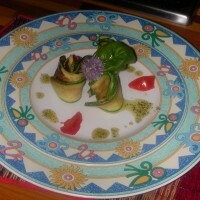 Wrap the cheese sticks in grilled zucchini and arrange the rolls in order to obtain the plate cylinder, seasoned with aromatic oil and decorated the plate with toasted pine nuts and basil leaves.